My name is Tom Paine, and I am 19 years old and from the UK. I’m currently an undergraduate studying Maths at Oxford University. Aside from Yu-Gi-Oh!, my main hobby is squash, which I play for my university. Aside from Dueling Network and making terrible maths jokes, it is what I spend my time doing. I went to my first local tournament in about 2007, and attended my first Nationals in 2008. I like playing with new decks when they come out, and making sure I know how to play all of them, so I know which is the best and how to play against them. I am also a fan of old formats and imaginary Yu-Gi-Oh!. My favorite deck ever would have to be Water Tengu Synchro, followed by various versions of Plant Synchro, Gladiator Beasts, T.G., and Mermail. 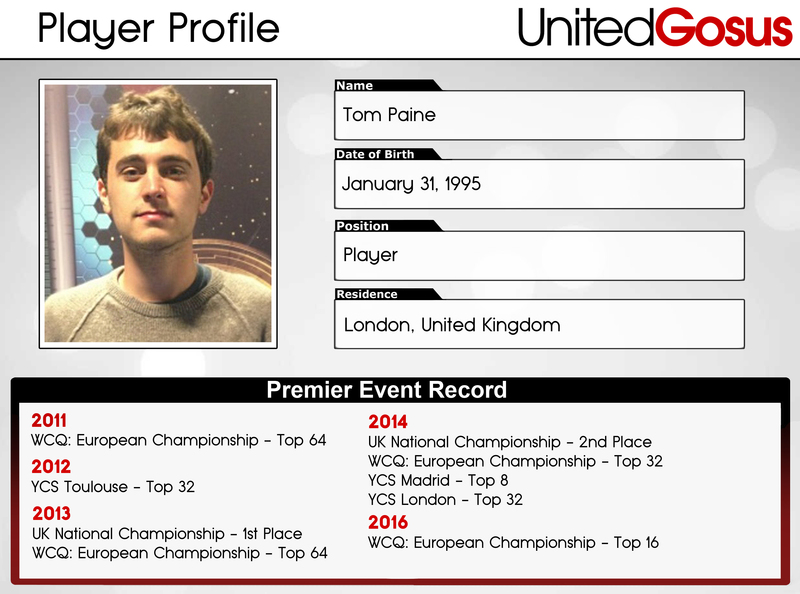 Tom is proud to be a client of the Yugioh Price Guru, a private trader and lender. For more information, please contact James Cooke through his Facebook page.